Helen Perham with her poster of Instagram selfies. Perham’s posts soon became a daily ritual, and morphed into something bigger: a yearlong project and, eventually, her senior honors thesis in studio art, where she analyzes her experience and her Instagram followers’ interaction with her work. 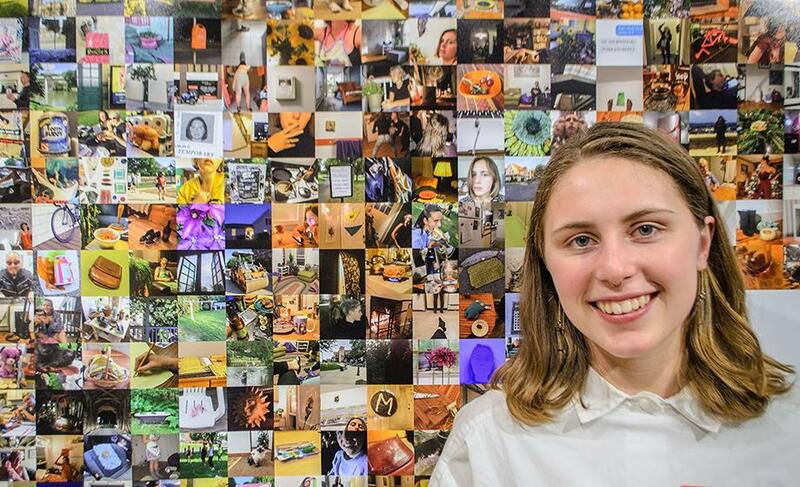 In actuality, Perham’s senior art exhibition, “365 Grams,” exists in cyberspace, accessible only to followers granted access to her private Instagram account. A more traditional, print-friendly, and public version of her Instagram photos is on display, along with the art of seven other graduating studio art majors, in Traina Center for the Arts’ Schiltkamp Gallery. Their Senior Studio Art Exhibition, “Beg, Borrow & Steal,” is open through Commencement weekend, May 19-20. Her mother especially appreciated knowing what Perham was up to in Italy. “It made me feel more a part of her life,” Christine Perham said at the exhibition’s April 25 opening reception, part of Clark’s Academic Spree Day. One of her best days? Seeing an icon in concert: “skipped two classes, saw Bob Dylan and watched the Celtics win.” But in Perham’s typical fashion, her accompanying photo is something more ordinary: a houseplant. Helen Perham’s art hangs at the Schiltkamp Gallery through the May 19-20 Commencement weekend. Perham used a decidedly non-artistic tool to analyze her Instagram data: an Excel sheet. She entered all of her captions, then coded words and places to measure the results. Her exhibition includes charts of data that allude to the content. One colorful pie chart indicates the frequency of the places where Perham posted — 30 percent of her posts originated in Italy, and 58 percent in Massachusetts (her hometown is Greenfield). Another pie chart zeroes in on Perham’s active verbs: 25 percent of her posts include the word “ate” and 19 percent, “made,” both of which speak to her enjoyment of food, from falafel and sushi to pie and waffles. For one poster, she arranged her 365 captions, line by line, somewhat chronologically, “abstracted to look like high-frequency sound waves. As if all captions and thoughts from the year were being screamed loudly and quickly,” Perham notes. For the largest poster, she lined up her 365 daily images in a calendar-like series of rows beginning on Jan. 7, 2017. Perham’s catalog of a year in her life ends on Jan. 7, 2018, just as she was to begin her last semester at Clark. Recently, her Instagram account had over 375 followers. Many are from Clark, where she also majored in international development and social change (IDSC). Perham soon will begin her fifth year at Clark in the Accelerated B.A./M.S. Program in IDSC. As an undergraduate, Perham was involved in Clark Unitarian Universalist Fellowship and the Salsa Encendida dance group, performing at International Gala for three years. A Presidential LEEP Scholar, she interned for four years at Main South Community Development Corp., which works with Clark’s neighbors to improve the surrounding area. “Part of what I do there is to think about how I can bring the arts into community development and work to transform the spaces where the community can come together,” Perham says. As for Instagram, Perham has stopped posting daily; as she got busier with this last semester of her senior year, her posts became more infrequent.